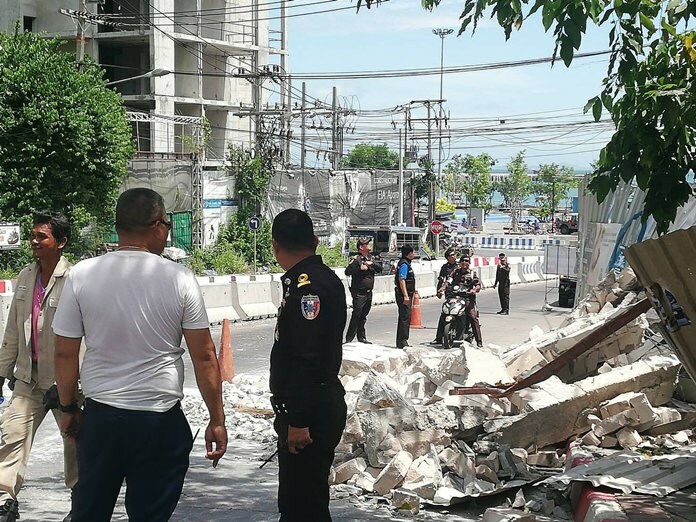 Debris from a building being demolished for encroaching on the South Pattaya canal spilled on to the Bali Hai interchange, blocking traffic, but causing no injuries. Traffic was jammed until Pattaya crews cleared the roadway. No cars or other property was damaged. The seven-story HBD House Co. structure was being demolished after being cited in July for encroaching on the canal zone. HBD, which held titles for two land plots in South Pattaya, had won a permit for the building by saying it would be built on the plot not adjacent to the canal. But, in fact, the structure extended meters into the public land once completed. Pattaya issued a demolition order in July and the owners tore down the building themselves.